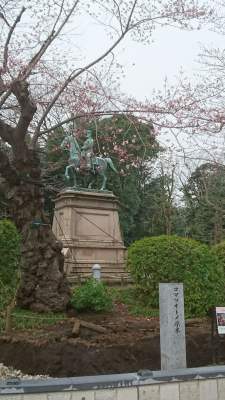 TsukuBlog | Komatsu Otome`s Blossoms in Ueno Park Have Us Shivering with Antici……Pation – for the Cherry blossom festival (hanami) there! The museums in Ueno Park, Tokyo (and there are six major ones there), put on some of the finest special exhibitions you will see anywhere in the world. With the Tsukuba Express getting me there from Tsukuba in less than an hour (with a change to the Yamanote Line in Akihabara), I often find myself scooting into Tokyo and back even when I`ve got just a few hours free in my day (and there`s something that I want to see). I sometimes find myself going in on several consecutive days (as I did last week) when there are multiple shows of interest. On my way to see Breughel: 150 Years of an Artistic Dynasty at the Tokyo Metropolitan Museum (thru April 1st), I left Ueno Station and crossed the street to enter the park. I passed by the usual people asking for donations to help abandoned dogs in Fukushima and those distributing anti-Abe (Prime Minister Abe, that is) leaflets . Though it was only 10 in the morning I found myself walking in a thick crowd. Some veered off to the right for the National Museum of Western Art for the Prado Exhibition (commemorating 150 years of diplomatic relations between Spain and Japan). Most though, kept on straight ahead. We passed under a banner put up to welcome visitors to the park`s world famous Cherry Blossom viewing event, which would begin as soon as the cherry trees (all of the SOMEI YOSHINO variety) burst into bloom at the end of March or early April. I looked to my left, where the festivities would take place and all the cherry trees, were, of course, were still bare. Remembering cherry blossom revelries of years past I walked on, keeping to the right of the long line of people that had already formed to get into the Zoo to see the baby panda. 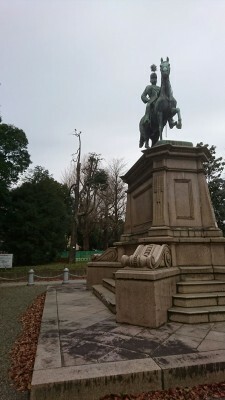 Over their heads, I could see the large bronze statue of an officer on horseback, a statue which many visitors to the park are familiar – though few know who it commemorates – Prince Akihito Komatsu. I turned into the Tokyo Metropolitan Museum, paid 1,600 yen for a ticket, and spent the next two hours lost in images of 16th and 17th century Flanders and Italy. I came picture-drunk, half-dazed and a little disoriented. Squinting in the midday glare, I stood still for a few seconds so that I could get my bearings and heading back to the station (I had to rush back to Tsukuba). The central square of the park, which two-hours earlier had been jam-packed with people waiting for the zoo, was now completely clear. There was someone standing with a sign saying: All tickets for Shan-Shan (the baby panda) Sold Out. I gravitated towards the statue of Prince Komatsu – noticed a single cherry tree in bloom! In front of it was a sign ( a pole, really) that said: KOMATSU OTOMOE (小松乙女). The Komatsu otome happens to be one of Japan`s most famous individual trees having gotten major news coverage in 2007, 2012 and then again in 2014. It all began when Professor Ikuro Nakamura reported a result of his genetic study showing that that particular tree (named after the statue next to which it grew) was an ancestor of the SOMEI YOSHINO variety of cherry tree, the most celebrated variety in Japan, and the center-piece of Japan`s veritable cult of cherry blossom veneration. Later genetic testing proved that SOMEI YOSHINO were in fact 47% EZOHIGAN, 37% OSHIMA ZAKURA, 11% YAMAZAKURA, and 5% other. I`m sure you care nothing at all about – but the fame of this tree is just further proof of how important cherry trees (SAKURA) are in this country. KOMATSU OTOME is actually a variety of cherry now found sparingly in many parts of Japan. It blooms a few weeks before the SOMEI YOSHINOs and thus gives us gentle prelude to all the excitement that is soon to come! 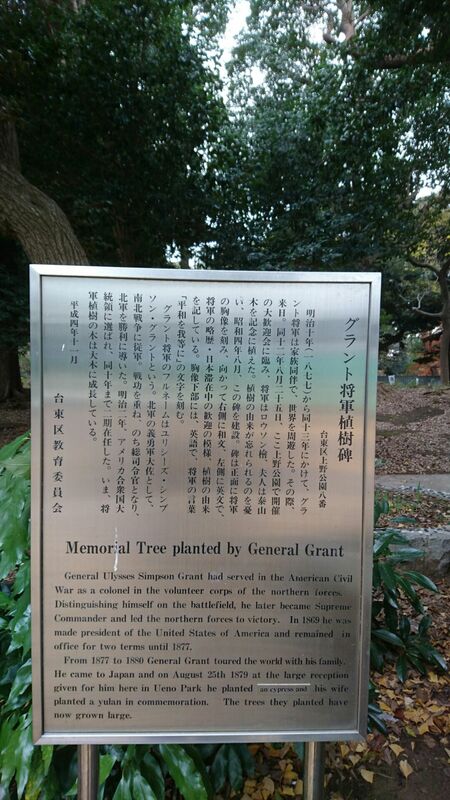 commemorating American President Ulysses S. Grant`s planting of a cypress tree in Ueno Park back in 1879 (Mrs. Grant apparently planted a tree as well).